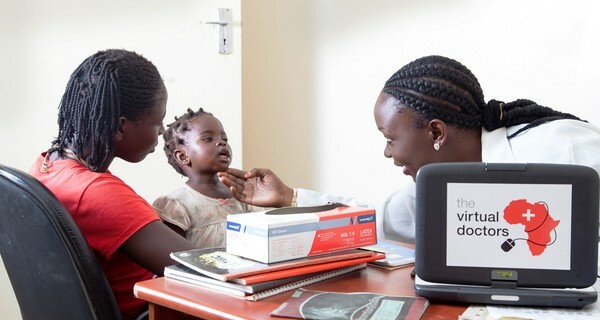 the Virtual Doctors, a UK-based charity, provides sophisticated, yet easy to use bespoke telemedicine (technology & medicine) software and smartphones with internet access. This empowers health workers in rural Africa by enabling them to send electronic patient files to volunteer doctors for diagnosis and treatment advice. As a result, patients are diagnosed more quickly and more often treated in their own communities, thus reducing the need for unnecessary journeys to distant hospitals for those patients already suffering serious discomfort from their symptoms. For Zambian health officer Kennedy Mulenga, the software is a game changer. When a patient arrived at his clinic with a growth at the base of his spine, Mulenga debated whether the abscess needed draining or whether that might risk paralysis. He consulted a virtual doctor who confirmed specialist surgery was required. The patient had the surgery and recovered. The service was developed by the Virtual Doctor’s founder and executive director Huw Jones. A safari guide in Africa in the eighties and nineties, Mr Jones said he witnessed a local tragedy and felt helpless to deal with it. He knew if earlier medical intervention had been available the life of a mother and her unborn baby would have been saved. After talking to medical professionals in Africa and Europe who were willing to help but could not work in rural areas, the concept for this telemedicine initiative was born and in 2008 the Virtual Doctors was launched. The service is now available in 20 rural health centres and two district hospitals in Zambia, and each clinic serves between 12,000 and 17,000 patients. The Zambian Ministry of Health has now included telemedicine in its strategic priorities. the Virtual Doctors are working on expanding into new districts and countries in Africa and beyond as the solution is suited to any remote locations. To support or volunteer for the organisation, visit www.virtualdoctors.org.